At some point, life with baby just begins to feel like life. I love all of the new "milestones" we're experiencing with him which are probably less of actual baby milestones and more just new experiences as a family! - Many of the latest adventures have already been blogged about, but Cyrus met three of his aunts for the first time, went on his first family vacation, and had a tarantula in his bedroom, so we've had an exciting couple of months! Baby's first hike and first waterfall! Rookies that we are, we packed the Ergo, left it in the car, and carried him without it. - Cyrus seems to be extremely extroverted at this current stage of life. He loves leaving the house. Whenever we are in an elevator with strangers, he immediately decides that the strangers are his new best friends and smiles at them and "talks." At any large gathering he'll typically be trying to chat with people non-stop. My mom says this characteristic reminds her of me as a baby--always wanting to talk to strangers, always thinking that obviously they wanted to talk to me. Cyrus is making many elevator friends for us. - He went swimming for the first time! - He doesn't sleep through the night, but he always wakes up happy and hungry. He just kicks and slides his arms around in his bed until I wake up from the movement, and gives me the biggest baby grins at 2 in the morning because he is ready to eat! - Cyrus has started joining Angel on his morning or evening jogs, riding along in the stroller for 5k or so. - He goes into phases where he learns something new and then does it incessantly. When he learned to blow bubble, he'd do it non-stop for long periods of time. He learned how to stick out his tongue and then he was always sticking out his tongue. He learned about how fun it was to grab his feet shortly before I took his 5-month old photo, which explains the pose. - I love dressing him up in his baby jeans and nice shirts. Angel, on the other hand, prefers him in onesies, and that's what he wears when we're staying home because it is so hot...but when we're going to air-conditioned places, I break out the baby jeans! - I sometimes wonder what the point of giving a baby a name is. I think we're calling him by his name more often than before, but still it's a lot of nicknames which seem to change daily. Weirdest one is "Chicken Nugget." - We read a lot of books together. Angel recently read him the entirety of our Spanish translation of "One Fish, Two Fish, Red Fish, Blue Fish", and I don't think he'd ever read the book before, because when he finished he told me, very seriously, that that is a very funny book and I was like, "I know right?! Dr. Seuss is awesome!" - My younger sister had a modeling gig for a line of wedding dresses last month, which got us all into joking that we're all going to be different kinds of models (i.e. some of us can be mom models, grandparent models, others can be preteen models, or sports equipment models, eating food models, etc, etc), and baby boy is going to be a "baby model," and because of his good looks, "V" birthmarks on the forehead are going to become the latest in baby fashion. - One of his favorite games to play is "Baby Godzilla," which you can see me playing with him in his five month video. When he plays it with Angel, it becomes "Baby Chupacabra" and all of the cries for help are in Spanish, so I guess that's being a multi-cultural family in a nutshell, for you. Linking up with What's New with You? He is so adorable! Growing so quickly! I love reading about your adventures with Cyrus, I'm just so happy for your family! He is so cute and seems like such a happy little guy!! He is looking more and more like his daddy the bigger he gets! What a cute, chubby baby. I love his 5-month photo. 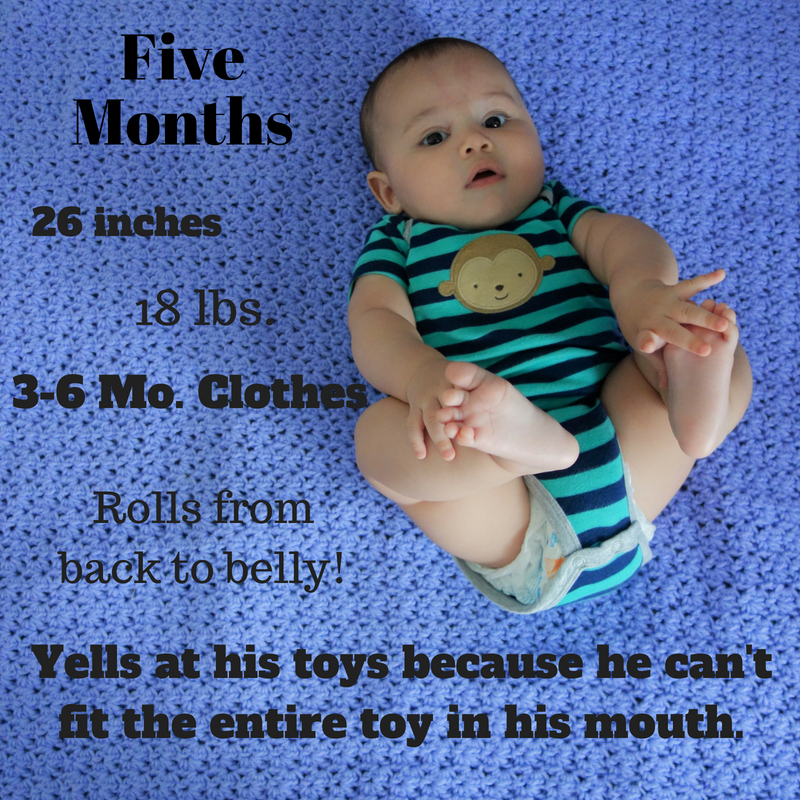 I love that he yells at his toys. Our baby just yells at *us*..not even crying, yelling...when he's hungry lol. Also, I never call him by his actual name, so I agree! I agree the baby jeans look adorable! And I love that he chats to strangers, how cute. Does he mind other people holding him? Well he is just the cutest thing. Especially in that collared shirt and jeans!! Adorable! He's so adorable, and those baby jeans are so darling on him. It's unbelievable to me that he's already 5 months old! I looooove baby jeans. He is really just too cute! Onesies are definitely the easiest, but there's really nothing cuter than baby pants. Seriously, a pair of pants that is like 5 inches long? Adorable.